Joanne is a weather warden, one of a few hundred people on Earth gifted with the ability to control the elements. Jo's gift is over water and air. She can summon up a storm and divert a disaster, but whenever a warden uses her power, the energy fallout has to go somewhere. And it's a daunting, thankless task managing where to expel it without creating another disaster along the way. Jo's job is made that much more difficult by the fact that she's recently become the unwanted owner of a Demon Mark, and the darkness inside will slowly consume her if she's unable to find a way to discharge it. Caine's writing is highly accessible and I had trouble putting the book down in between sittings, mostly because I liked Jo and David (and Lewis). I liked the unusually deft incorporation of flashbacks to Joanne's college years and warden training days to show the reader how she came to be the girl she is. It's always fun sinking into a new world, particularly one like Caine's--that rare urban fantasy sans vampire, shape shifter, or other furry beastie. Although Jo's world isn't a completely Mythic Creature Free Zone. Most advanced wardens are given a Djinn--a magical being bound to serve them. (And, yes, they do usually come complete with a bottle to call home). The Djinn were a fun addition to the world and I can tell they're going to play a much larger role in the books to come. Coinkydink - I just borrowed this from the library yesterday. I read Heat Stroke earlier in the year, but I had trouble keeping up with it - it was difficult because I hadn't read this one first. I guess it's a series that MUST be read in order. Hey, Tez! 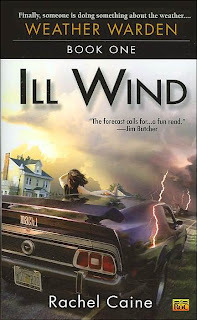 Yeah, I'm in the middle of Heat Stroke right now and I would have been totally lost if I hadn't read Ill Wind first. Thea, I completely agree. It's just sort of delightful to have all the magic be weather and Djinn related. Nobody biting anyone. Although at this exact point in time I am very conflicted about Lewis.